When I was teaching English in Japan, students often asked me if there were kangaroos hopping down the streets outside our houses. I always laughed and said this was a myth and a totally stereotyped idea of Australian lives. Now I smile when I remember that time as where I live now, there really are kangaroos hopping along the streets outside the houses and lingering in our garden wherever there is yummy fresh green grass to munch on. 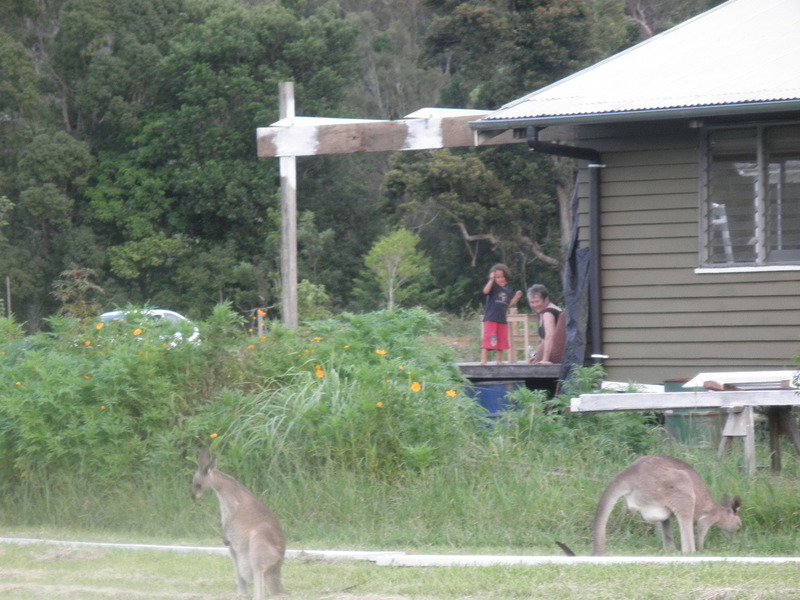 We live in an ecovillage in southern Queensland on the east coast of Australia. It’s a beautiful 200 acre property, once a dairy farm that belonged to the grandfather of my very very dear friend Eve who passed away 6 years ago. So besides being a beautiful place to live, it also has sentimental value for us. Eve came on walks here with us when there were still cows roaming around before it began to be developed into the community that it is today. We bought in here for a number of reasons but mainly because we wanted our children to have a beautiful and free place to grow up in, for them to be surrounded by nature, to be able to climb trees and run around, to swim and explore. 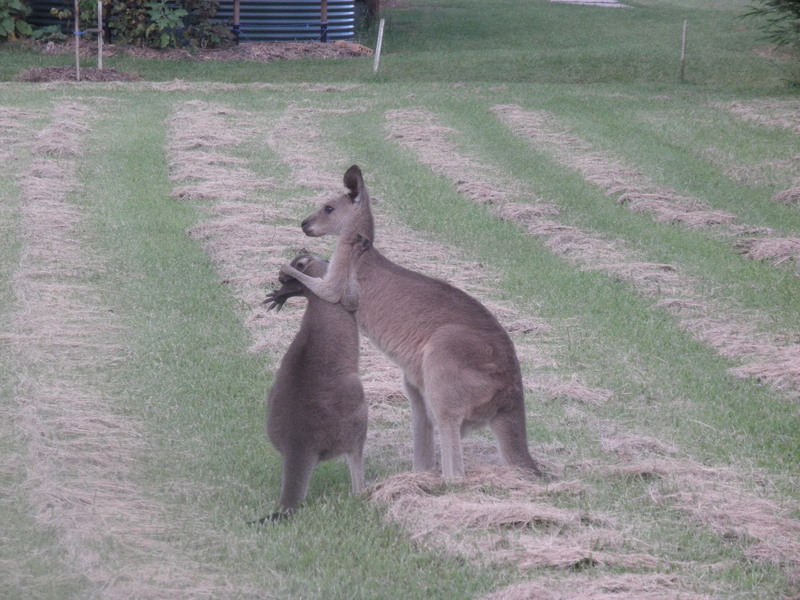 We can’t have cats or dogs here in the ecovillage because of the kangaroos and the bird life but it was a worthwhile sacrifice because we can enjoy the beautiful wildlife around us. Children in the ecovillage have guinea pigs and chickens for pets instead. 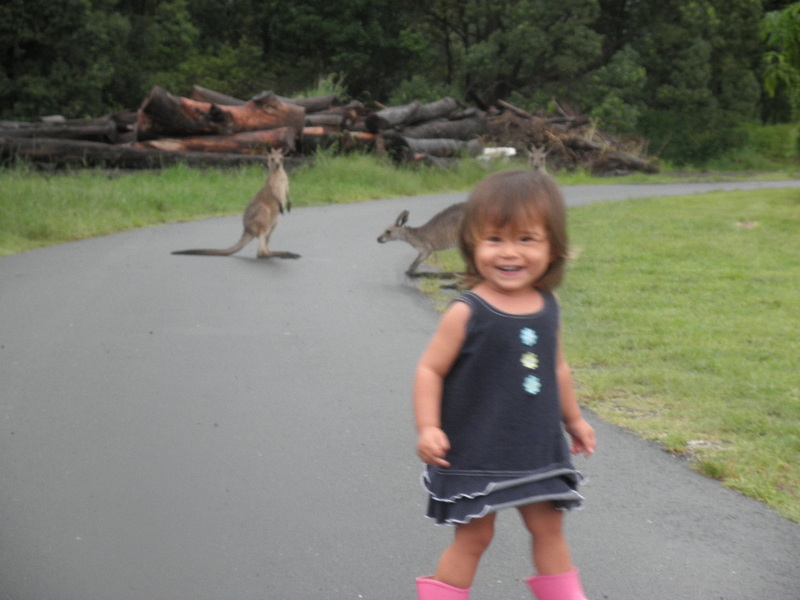 The kangaroos are wild animals, we can’t feed them or pet them but we enjoy living side by side. I feel so privileged to be sharing this space with such beautiful animals and watching how they live. Nice blog Filippa. I discovered you because the “Kangaroo in the suburbs” post listed at the end of yours as a “Possibly related post” is mine. And I notice that you are using the same WordPress theme that I am. Good choice! Were you a JET in Japan? Our son was there for three years so we visited him twice. Wonderful place. Hi whisperinggums, Thank you! I linked through to your blog too. Haven’t had a chance to have a good read yet but admired the beautiful photo of the big roo in the garden! I lived and taught in Japan (Tokyo) for 5 years in my early twenties. It was there I met and married my husband. We didn’t want to have children in Tokyo because we knew they could have a much healthier and freer lifestyle in Australia. We love living here but we also love Japan and are now thinking of returning there temporarily at some stage so our kids can get to know their Japanese side and be immersed in the language. Particularly now we have a little eco-haven to return to.